I thought it would be fun to build all three ships. It was. I would recommend doing them in order easiest to most complex. I made the Nina first, then the Pinta and am working the Santa Maria now. It was a learning experience for sure. The instructions as mentioned in another post are not very specific but looking at pictures, studying plans and pictures and some trial and error allowed me to work it out. The advantage of doing them in order is that skills are but as you get experience from easy to difficult. The kits are well made and the finished product is really worth it. All-wood construction features african walnut, mukali, plywood, and sapelli. Brass hardware such as eyebolts, hinges, capstan, nails and more. Two colors of brown thread for realistic rigging applications. 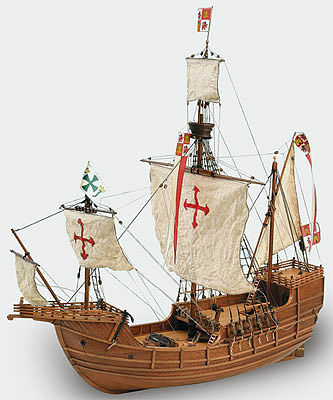 One Latina 1/65th Santa Maria Model Kit with pre-sewn sails, all fittings and rigging, all deck planking, hull, masts, bowsprit, two rolls of rigging thread, flag, photo-illustrated instruction sheet and plans. Difficult in parts, but a challlenge and learning experience. You almost need a jig of some kind to do the rope ladders. Great plans--Next is the Pinta and then the Nina. The instructions for this kit are the most pathetic I have ever come across. They are vague and do not translate well from Spanish. The photos don&apos;t match the kit and the one sentence for the rigging states that it would only confuse one to include them so refer to to the included photo that&apos;s surprised, isn&apos;t enclosed...don&apos;t waste your time or money.